Assume That Leftists Are Liars. Like Father, Like Sons. I hate to do this. Really. As a wordsmith I think that a column should stand on its own. But on rare occasions one needs to point to evidence, vivid proof for the ear and eye that mere paragraphs can’t render. You’ve all learned by this point that the Covington Catholic boys were completely innocent. Smeared with outrageous charges, lied about, painted as villains. Powerful media figures proposed punching them in the face, contacting their colleges to ruin their educations, and hounding them for life. Disgracefully, many conservatives joined the lynch mob without a second thought. But unless you watch this video produced by the boys’ attorneys, I don’t think you know just how outrageous the lies really were. Please, take a pause from reading now. Go brew a cup of coffee. And sit back to watch this entire 15 minute video. If you don’t you won’t realize just how dangerous these times really are. Seriously, watch this, then come back to read what I have to say about it. So Nathan Phillips lied, blatantly and repeatedly, maliciously and publicly. He did so with the intent to defame innocent high school students who’d been waiting for their bus. Who’d come to D.C. to defend the most helpless Americans, unborn children. Phillips whitewashed the hate speech of rabid black bigots. And professional journalists lapped up the lies, without ever bothering to check them. That’s no surprise to us, is it? Leftist activists weaponized the lies against hapless private citizens. Again, par for the course. What disturbed me? How quickly establishment conservatives jumped to join the piranha pack. We saw dozens of “respectable” conservatives (and the Covington bishop) desperately feeding the Covington kids to the crocodiles, in the hope of getting eaten last. As Jason Jones wrote here, instead of defending the scapegoat from the mob, they joined in the sacrifice. Or at least to hide from it, as all the apostles except St. John did on Good Friday. Only the release of authentic, uncut footage filmed by one of the Black Hebrew Israelites forced such conservatives to finally rally around the innocent. How Many Innocent Conservatives and Christians Suffer? 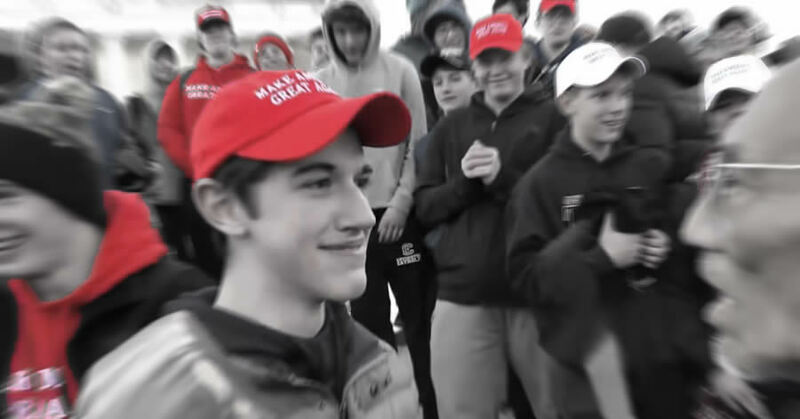 Without that video, where would the Covington boys be now? They’d be disgraced, expelled, exposed, and facing ruined lives. Their bishop and the leaders of establishment conservatism would be complicit. And that would be that. Just a few more bodies on the pile, along with the hundreds of thousands of dead kids the boys had marched to defend. Other conservatives have suffered similar attacks in the media, but haven’t been lucky enough to have detailed video filmed by their enemies and posted on Youtube which refuted all the charges. Instead, the left targeted them, their allies threw them under the bus, and under the bus they remain. That’s what happened to Rep. Steve King, I believe. And it’s happening right now to Candace Owens of Turning Point USA. She tried in a talk on nationalism to show how Hitler’s regime only became a threat to citizens of neighboring countries because of his imperialist ambitions. Leftists (and conservatives envious of her success) are now trying to paint that as support for Nazi anti-Semitism. They’re doing so, of course, by quoting little snippets of her talk, wrenched out of context. Another victim of a leftist smear campaign is the goofily outrageous Gavin McInnes, whom the biased and unreliable Southern Poverty Law Center falsely labeled a white supremacist. BlazeTV abruptly canceled his show. Social media monopolies de-platformed him. Yes, I understand that there are genuine hatemongers, like Richard Spencer and David Duke. They deserve our shunning. Conveniently, they’re usually quite open about their views. We don’t need blatantly biased leftists at the Southern Policy Law Center to ferret them out for us. I don’t know for an absolute fact that Steve King or Gavin McInnes are entirely innocent of every single reckless charge cast against them. I can’t speak for all their motives, since I don’t know them. But I do know that some of what the media have published about them amount to blatant lies or gross distortions. And I’ve seen how biased leftist editors manipulate information. Now you have too, if you watched the video from the Covington boys’ lawyers. So here’s what I suggest, going forward. When you see a story accusing some pro-lifer, conservative, or Christian of being a racist, bigot, or hatemonger, go through the following steps before deciding what you think. Keep the presumption of innocence. Assume that leftist media are lying. Or distorting the truth so grossly that there’s no moral difference. Remember the left’s track record of uncritically repeating lies about President Trump, and the Covington kids. It’s a safe bet they’re doing so again. Keep an open mind. If you see an unedited video or authentic document that proves the accused person really does hold to hateful views, you can revise your verdict later. Consult the primary sources. If you decide to weigh in on one of these cases, do your research first. Read for at least two hours, consulting both sides. Give extra weight to the statements of the accused, and make allowances for the disproportionate power of the Left to control the narrative. If you decide the person is innocent and unjustly accused, and you won’t lose your job for doing it, weigh in in his defense. If we do not hang together, we will certainly hang separately. At this point, someone who suffers from extra scruples might step in and object. Shouldn’t we practice the same presumption of innocence for liberals, too? Ought we not to apply identical standards, regardless of right or left, or Us and Them? Ten years ago or even two years ago, I might have agreed. But now I say “No.” That’s because establishment media, social media platforms, universities and even corporations have abandoned objectivity and fairness. They unashamedly bend the rules and censor data to fit their leftist narrative. The bias is now so extreme that if information does emerge (except on the fringiest surviving right-wing blog) that seems to damn the left, it’s likely true. Of course, you shouldn’t go off half-cocked and spread negative stories about a person if you haven’t done some digging. But assume that the thick layers of bias and censorship designed to protect the left mostly filter out false stories. The opposite is true for charges against Christians and conservatives. You’ve no obligation to lie to yourself and pretend otherwise. In fact, doing that just plays into the hands of the Enemy. Now maybe that sounds … overwrought to you. If it does, I’ve another clip for you to watch. Just so you know what we’re dealing with. Or rather, I ought to say, whom.